Just so's you know, the Back to School Sale is still in effect - you can enter the code "tetherball" at checkout and get 28% off your whole order until next Wednesday. Where were we? Oh yeah. From time to time, we'll be showcasing some of the best entries in our now-legendary Celebrity Mashup Photoshop Contest. 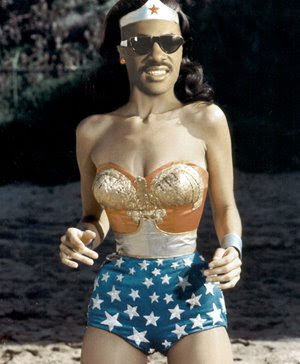 To the right, please admire Stevie Wonder Woman. Equally adept w/ the piano and the magic golden lasso, she can't see his invisible plane either. Let's reinstate this thing! Here's what you do - take at least two celebrities, mash their names together, then photoshop your creation and send it to us. We'll pick a winner and announce it a month from today - Sunday, Sept. 21. The prize? P.S. Big ups to our friend Hannah for coming up w/ the whole Celebrity Mashup thing. Best Halloween party since before the beginning of time.